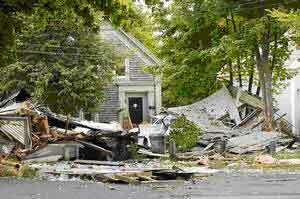 An explosion from a natural gas leak flattened this home under construction in South Portland. 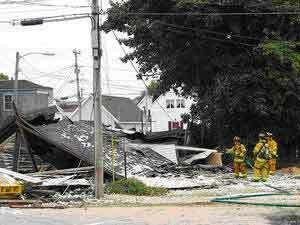 SOUTH PORTLAND - A natural gas explosion leveled a house on D Street this morning, forcing city officials to evacuate a 2.5-block area in the Knightville neighborhood. No one was injured in the explosion, which occurred around 9 a.m., said South Portland Fire Department spokesman, Lt. Robb Couture. He said the building was unoccupied and undergoing renovation. 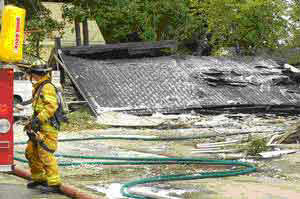 Firefighters hose down the remains of a home destroyed in a natural gas explosion. "I thought I was back in Vietnam for a minute," said Lee, a neighborhood resident since 1991. He and other residents remained outside the evacuation zone this morning as officials continued to search for the source of an underground leak. Tom Bruton, of 51 D Street, said he heard a loud explosion, looked out the door, and saw construction workers running down the street and pounding on doors. "My wife and I ran out, literally with the clothes on our backs," he said. A neighbor, Bryan Davis, of 55 D Street, said he was just getting into the shower when he heard "a loud bang." " I looked out the window and saw someone pounding the door, yelling 'get out, get out.'" Downstairs, Davis saw the pictures had been blown off his walls. He ran out into the street, then realized he had left without Buddy, the mixed-breed lab he is watching for a neighbor who is out of town. So he ran back inside to get the dog. "He was a little shaken up," Davis said. He and Bruton said utility workers had come to their homes earlier in the morning to check for gas leaks in their basements. Bruton said workers from Risbara Construction have been digging up D street for about a week, working on water mains. He said the pavement in front of his house was torn up just this morning. "The funny thing is, I had looked out the window this morning and asked my wife how they could do that without shutting the gas off." A gas leak had been reported at the building about an hour before the explosion, and the fire department responded along with Northern Utilities, the gas company. 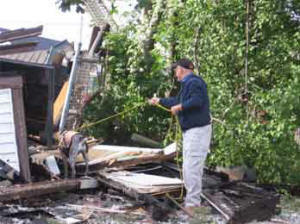 Couture said the fire department cleared the scene after Northern Utilities inspected the site. The neighborhood was not evacuated at that time so people were still in their homes and nearby businesses when the blast occurred. Firefighters initially evacuated the entire Knightville area between Broadway and E Street but the area was reduced to the two blocks on each side of the building. Workers located the leak and capped it around 3:15 p.m., said Couture. He said power was restored in some areas, but not on D Street, and evacuated residents had not been allowed to return to their homes yet. 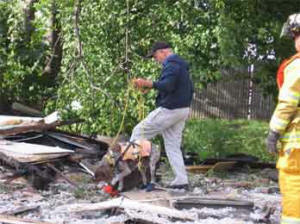 Couture said officials needed more time to investigate the explosion and remove debris. He said officials hoped residents would be allowed back into their homes later tonight. The one and a half-story house that was destroyed, 43D Street, was built in 1890 and was listed by the city as worth about $100,000. The city lists the house as owned by the Notis Family Trust, which is located on Ocean Street in South Portland. Staff writers David Hench and Trevor Maxwell contributed to this report. Reproduced with permission from the Portland Press Herald/Maine Sunday Telegram. 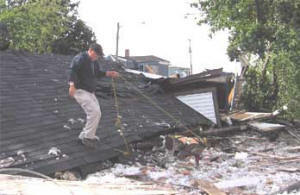 Spencer Fuller and K-9 Gabe do a search of the collapsed building before the building is bulldozed. Spencer and Gabe are a certified cadaver dog team.